Chances are that the only thing you may have heard about director Sebastian Schipper’s Victoria is that it was all shot in one continuous take. But unlike Birdman or Alfred Hitchcock’s Rope, which were actually separate shots cleverly manipulated into looking like one long continuous shot each, this one truly is an unedited single take from the first frame right through to the last. It took three attempts to film (with the second apparently used as the final cut), the dialogue was largely improvised since it was also a 12-page script, and the camera miraculously never seems to either run out of battery or memory space for the entire two-hour and eighteen-minute running time. That in itself is a pretty incredible technical achievement –something even the film recognises, as cinematographer Sturla Brandth Grøvlen is credited before director Schipper at the end – but what you might not expect going in is that Victoria is actually more than just its gimmick: it is a pure human drama riddled with tension and underlying character moments, one that will have you on the edge of your seat more than most thrillers we’ve been getting lately. The film, and by extension the shot, begins as we meet Victoria (Laia Costa), a Spanish woman recently moved to Berlin, dancing the morning hours away in a nightclub – by the way, it’s worth mentioning that this opening section comes with some pretty heavy strobing lights, so those with epilepsy or any similar conditions might want to seriously consider protecting their eyes or even leaving the auditorium in more severe cases – and, as she’s leaving, she runs into a group of guys seemingly out celebrating a friend’s birthday. Thus begins a real-time adventure that seeps right into the early hours of the morning, starting out as a spiritual successor to Richard Linklater’s Before trilogy with all the natural conversations between actual characters (remember, the dialogue is largely improvised by the actors), but then quickly turning into a much more intense crime thriller when Victoria is suddenly called upon to act as a getaway driver for a bank robbery that the guys must pull off to pay back a gangster. Though on paper it may sound as though the tone takes a complete U-turn as the film genre-hops from one to another, Victoria remarkably keeps itself steady all the way through, and as the chain of events becomes ever more intense and even deadly the humanity of it all is never sacrificed, because it allows itself a slow-burn pace that in turn gives us the time to properly identify these characters as actual people in this situation. When the time comes for the film to make that switch, we are invested enough in these people to actually want to continue following them, seeing how or if they make it out of everything in one piece. It’s thanks to the naturalist dialogue improvised by the actors, from the tiniest of well-disguised flubs (one person briefly mistakes a café for a hotel, a location used later in the film) to the longer drawn-out instances where we learn more about their characters’ backgrounds like spending time in prison or an unflustered talent in concert piano, as well as the actors themselves who all do an outstanding job at keeping the momentum going as the camera follows them wherever they go. Schipper also seems to have a knack for being able to create a good amount of suspense within later sequences, single-shot cinematography aside. From the moment the group is given their assignment by the intimidating crime boss, the film is put into a higher gear where everything – be it a sudden panic attack or a car engine stalling – leaves you uncertain of how everything will transpire, partly because you’re on board with these characters but also because Schipper has laid out everything so tightly with the camera angles and pacing that you would be forgiven for thinking that everything could go downhill at any second without much warning. It’s actually an ingenious way of suckering in a curious audience that’s come for the style but ends up staying for the substance; and although it will require a lot of patience with its slow-burn and even its exhaustive camera work, you will eventually feel glad that you ended up catching a real gem like Victoria. 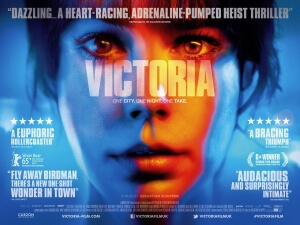 Victoria may boast the incredible technical achievement of having everything be filmed in one unedited single take, but it’s actually the firm grasp of strong character and pulsing tension when they could have so easily been lost in the mix that ends up being the real accomplishment.